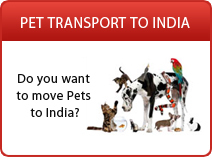 A maximum of 2 pets per shipper can be imported to India, as excess baggage or accompanied cargo. The pet owner or caretaker must accompany the pet during the transport in order to fulfill the requirements for non-commercial transport. Pets can be imported into India as excess baggage through most major Indian airports. If you are bringing your pet as excess baggage, you will need to have to apply for an No Objection Certificate (NOC)/ Import Permit from the Animal Quarantine Station. However this cannot be applied online and will require the assistance of an agent in India. The process to obtain NOC will take 2 to 3 working days. 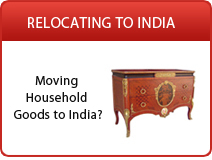 Hence all documents required for obtaining NOC should be sent 7 working days in advance to the pet moving company. Obtain No Objection Certificate (NOC) from the Quarantine Officer at the Animal Quarantine Station in India 5 days before your travel. Provide a copy of the NOC to the airline in order to reconfirm booking of the pet. Affix a duplicate copy of the NOC to the crate during the air travel. Produce a copy of the NOC in India to get the pet released from the customs at the Airport in India. On arrival in to India, immediately take the pet to the Quarantine Officer (prior appointment required) for examination and issue of a temporary Health Certificate. After 30 days obtain a certificate of health from a local veterinarian and produce it to the Animal Quarantine Station and obtain a permanent quarantine certificate. As Unaccompanied Cargo / Manifested Cargo. 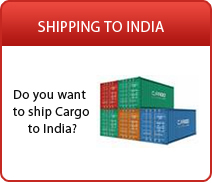 Disclaimer: Although Ship2India.com has tried to make the above information as accurate as possible, Ship2India.com accepts no responsibility for any loss or inconvenience sustained by any person resulting from information given above. Ship2India.com encourages you to verify any critical information with the relevant authorities before you book the consignment.